I’m a big Jason Bateman fan (as previously mentioned in my Horrible Bosses review) and I’ll pretty much watch anything Ryan Reynolds is in as well. In fact, if I’m attempting to romanticize a lady, well I’ll often put in Definitely, Maybe because that’s just a wonderful movie and I don’t care who knows. 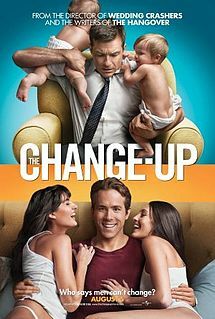 However, after seeing the commercials for The Change-Up, I was not filled with excitement at the idea of yet another body swap movie. I mean, could this movie have anything more to say than Freaky Friday, Vice Versa, Like Father Like Son, Freaky Friday (again and again), 17 Again, Switch, and holy hell, there are a lot of movies that explore this premise. I don’t think Face/Off counts because they didn’t really switch bodies, just faces. So yes, this is well-trod territory here. Written by Jon Lucas and Scott Moore (of The Hangover fame) and directed by David Dobkin (famous for The Wedding Crashers which doesn’t hold up to repeat viewings in my estimation), it stars Bateman and Reynolds as Dave and Mitch, two childhood friends who went different ways in their lives. Dave (Bateman) went the safe, reliable, hard-working way and has three kids and the gorgeous Jamie (Leslie Mann) as his wife. Mitch (Reynolds) is kind of a man-child, not really a success at anything except nailing many women. These two characters are so vastly different but so similar in age that it sort of has a different take on the genre, I guess. I’m heavily biased here, no lie, as I enjoy Bateman, Reynolds, Mann and also the impossibly gorgeous Olivia Wilde is in it to boot. The beginning third of the film was a bit uneven, but once it hit its stride, I enjoyed it a lot. There’s a scene near the end that brought out actual emotion in me, and while it isn’t a perfect comedy, it’s entertaining. I like this new breed of comedy where they actually shoot for an R-rating, littered with plenty of well-placed and emphasized f-bombs.